Jackie De Sesto, known ever since his boxing days as Jackie Disaster, has retired from the ring to run Allegation Services, an Atlantic City crisis-management firm, from rooms overlooking the gaming floor of the Golden Prospect Casino. Golden Prospect, under the management of the luscious Angela Vanni, the gone-legit daughter of a dead mafioso (Money Wanders, 2002), is his main client, but even the constant need to fend off the scams of made men like Frankie Shrugs and Petey Breath Mints leaves him and his Imps—the Damon Runyonesque trio consisting of Teapot Freddy, the Lord, and Nate-the-Great—time to salvage other images. Right now he’s bent on refurbishing millionaire Sally Naturale’s reputation, tarnished by a lawsuit Murrin Connolly has brought against her and her company that claims their organic soy milk caused her miscarriage. According to pollster Jonah Eastman, discrediting Murrin is the way to go, but they also have to show Sally eating humble pie, because Cricket Crest, her ne plus opulent enclave in South Jersey’s Pine Barrens, has made the deprived masses unsympathetic to her. From this point on, disasters pile up quickly and satisfyingly—including the destruction of Cricket Crest and the disappearance of Sally—although it takes Jackie and the Imps a while longer to see through the despicable alliance between Frankie Shrugs and Bebe, Sally’s slithery brother, and to understand the reason for all those chirping crickets at the enclave. 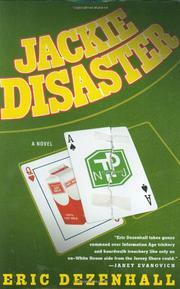 Barbed and cruelly witty: Jackie Disaster is the best thing to come out of Atlantic City since saltwater taffy.